"Pain is whatever the experiencing person says it is, existing whenever he says it does..." - McCaffery. Cultural beliefs - The word pain is derived from the Latin word poena, meaning a fine or a penalty. Pain has been understood by various cultures to be: an expected part of life, a treatable warning sign, an offering to god, god's will, a sign of disharmony or energy obstruction, etc. Specificity theory - In the 17th century, Rene Descartes proposed a mechanistic system of site specific pathways that informed the brain of injury. Some iteration of Specificity theory was the medical paradigm of pain for centuries. 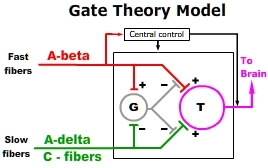 Gate Control Theory - Melzack and Wall recognized that nociceptive impulses transmitted through "slow" C and A-delta fibers could be modulated by activation of local "fast" A-beta fibers. They proposed that "fast" and "slow" fibers synapse on "gate cell" (G) interneurons within the dorsal horn of the spinal cord. Competitive activation of "gate cells" by "Fast" fibers was believed to close the "gate" thereby modulating transmission and the subsequent cortical perception of pain. Gate control theory is often used to explain the pain reducing effect of stroking or vibration when applied to an area of injury. Body-self Neuromatrix theory - proposed by Melzack, integrates sensory, emotional and cognitive patterns to construct the perception of pain. These "patterns of the Body-self Neuromatrix activate perceptual, homeostatic, and behavioral programs after injury, pathology, or chronic stress. Pain, then, is produced by the output of a widely distributed neural network in the brain rather than directly by sensory input evoked by injury, inflammation, or other pathology. The neuromatrix, which is genetically determined and modified by sensory experience, is the primary mechanism that generates the neural pattern that produces pain. "• Body-self Neuromatrix theory attempts to explain: a) variations in the pain experience between individuals, b) chronic pain and c) phantom limb phenomenon. Acute pain has a sudden onset and resolves as healing occurs, usually within 30 days. Pain is often described as acute or chronic. These terms provide more or less arbitrary indicators of duration but offer no information regarding underlying pathophysiology. The terms nociceptive and neuropathic are more indicative of the pathophysiology responsible for the electrical impulses interpreted by the brain as pain.